The sacrospinous ligament is a triangular layer of fibrous tissue. Sacrospinous ligament is a thin ligament attached to the ischial spine and the side regions of the sacrum and coccyx. Base connected medially to the side of sacrum and coccyx. On each side of the body, the greater sciatic foramina from the lesser sciatic foramina on the lateral pelvic wall are separated by spines and sacrospinous ligaments. Contribute in defining the spaces between the pelvic cavity and adjacent regions where structures pass since, the sacrospinous along with sacrotuberous ligaments are major components of the lateral pelvic walls. By resisting the upward leaning of the inferior aspect of the sacrum these ligaments stabilize the sacrum on the pelvic bones. The greater and lesser sciatic notches of the pelvic bone are also converted by them into foramina. 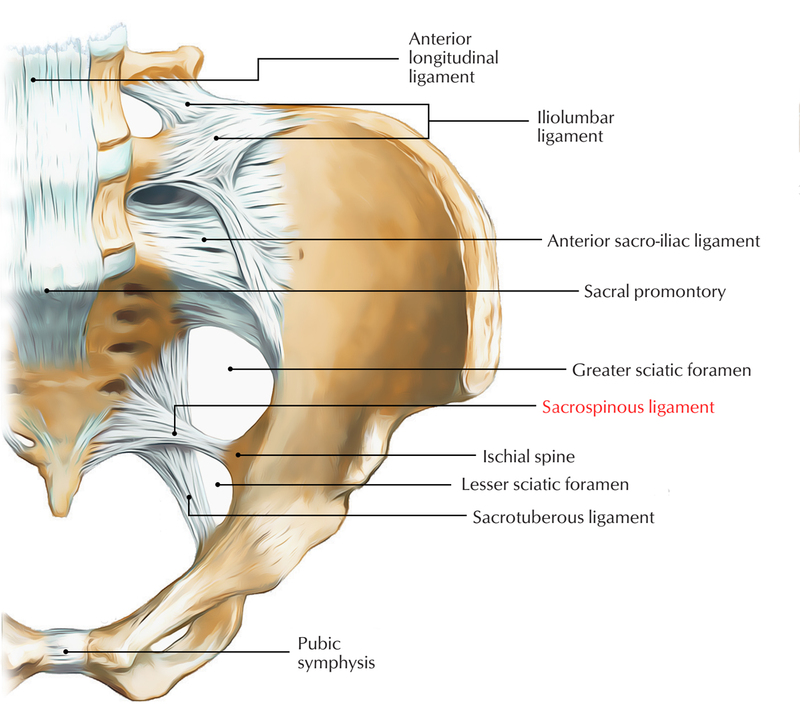 The lesser sciatic foramen lies inferior to the ischial spine and sacrospinous ligament between the sacrospinous and sacrotuberous ligaments. The greater sciatic foramen lies superior to the sacrospinous ligament and the ischial spine. Rotation of lower end of the sacrum and the coccyx at the sacroiliac joint by the weight of the body is prevented by the sacrotuberous and the sacrospinous ligaments. The pudendal vessels and nerve pass behind the sacrospinous ligament directly medially and inferiorly to the ischial spine. The inferior gluteal artery pass behind the sciatic nerve and the sacrospinous ligament which is left open at a small opening above the top of the sacrospinous ligament, from a branch of the internal iliac artery. An effective treatment for vaginal or rectal prolapse is suspension of sacrospinous ligament. When ligaments and supportive structures become weak vaginal prolapse or rectal prolapse occurs in women.